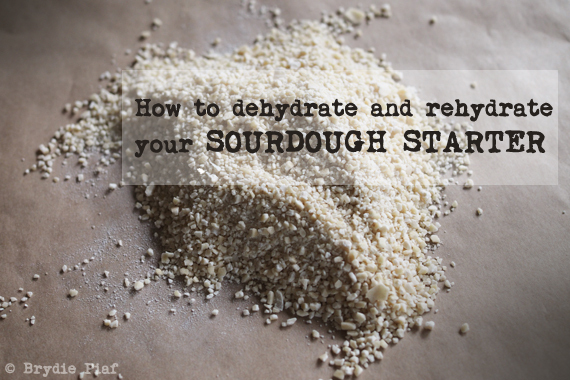 How to dry your sourdough starter, and bring it back to LIFE again! Baking your own sourdough bread from a little naturally fermented flour and water (starter) is one of those simple things in life that’s hard to move away from once you begin. Being able to dehydrate it and then rehydrate it, essentially bringing it back to life again is another handy additional skill to have as a sourdough baker. Being a home baker, means that on the odd occasion I’m asked for a some starter to get people going with their own sourdough journey. It’s something that is forever growing and being used, so it’s easy enough to do and if it encourages someone to get cracking with baking the ‘good stuff’, well, I’d like to be a part of that. Here’s a quick tutorial on how to first, dry the starter if you are the giver and how to revive it if you are the recipient. Sourdough Starter– refreshed and bubbling. The more alive it is, the easier it will be to trap that fermented goodness and revamp it again down the track. Sun– you can use a dehydrator or an oven on low, but if you have access to sun, use it. First up, spread some of your refreshed starter on a paper lined baking tray. Thick or thin is up to you, depends on how long you have and sun quantities. Obviously the thicker it is, the longer it will take. If you can cover it at all with some fine wire mesh, or muslin do so. This keeps out any nosy bugs that might be keen to check out what’s going on. Keep it in the sun until it’s nice and dried. Break off into small flakes and store in a glass jar, or alternatively grind your dried starter in a blender and again store in a clean glass jar. And now pass it on to someone who will love it as much as you will! Mix the three ingredients together in a ceramic bowl (at say 6am.) Cover it, muslin and a rubber band, beeswax cover or a loosely fitted lid of a glass jar. Leave it in a warm spot- top of the fridge is good during winter or just the kitchen bench top over the warmer months. At 6am the next day, add 80mls of water and 50g of flour to the mixture, stir it through and cover it again. Back to the warm spot. At 6am the following morning, add a further 200mls water and 150g flour. Mix together and cover, leaving in the warm spot. As the day progresses check it for bubbles, if it looks a little sluggish leave it for another 24hours and if it’s got lots of happy bubbles action going on, you can make up a dough about 12 hours later- say 6pm. Also, make sure you have a good smell of it. If it smells like flour and water it’s not ready, if it smells sourdoughy it’s getting ready to rock. Make sure before you make up your dough, you leave some aside to keep as your mother, which can now be stored in the fridge. cityhippyfarmgirl (at) gmail (dot) com. Sorry international peeps, Australia only at this stage. If you would like more information on baking sourdough, there is a backlog of info within here. 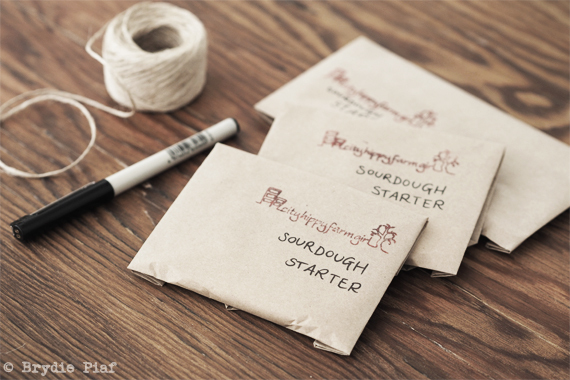 How to create your own sourdough starter from scratch…it’s easy, promise. If you have any further specific questions please read through the comments of this post here. There are 95 comments, which equals to a whole bunch of potential information. If you still have further questions, pop them into the comments and I will do my best at answering them a little further down the track. 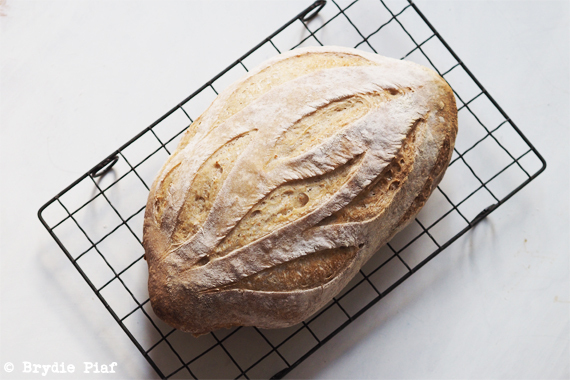 This entry was posted in Baking Bread and tagged bring back your starter, Connecting with Community, dehydrating your starter, dried sourdough starter, how to make a sourdough starter, rehydrating sourdough starter, solar drying by cityhippyfarmgirl. Bookmark the permalink. What fun! I must admit, I still have Ms Celia’s amazing sourdough starter in my fridge. I keep wanting to have a go (again) at baking sourdough and now that Brunhilda is back in force 24/7 (thank GOODNESS today it is pelting down…) it is very tempting to rehydrate Ms Pricilla and give her the old college try. I guess I keep remembering all of that feeding and my vinegar brick results. Note to self “do NOT let defeatism prevent you from trying again”. Might be time to dust off my derierre after falling off that particularly crazy horse and start again. What’s the problemo do you think? Vinegar brick, sounds like not enough life in there. feed it up a good few times before you want to bake with it and try again Ms Narf. I’m intrigued by your brick like results and would love to help if I can. Honestly just don’t over think it. Feed it up three times before you want to bake with it in a 24 hour period. This is definitely flexible if it’s strong enough but for the beginning lets stick with the three times and see if you can work on those vinegar bricks eh. Are you on instagram? Send me direct pics if you are. I had best get some strong bread flour in then. Get in there Laura, you can do it, I know you can! Happy baking adventures to be had my girl. Very clever slashing in your second photo Brydie, just gorgeous. I have been handing out some starter to friends lately, so this post is very useful. Thank you. The DR is in, how funny, love your work. oh no! That’s a horror story Gillie, I’ve heard these stories before and they chill me to the marrow.